The fabulous Singer Building, 186m high and easily the tallest building in the world when completed in 1908, was designed by Ernest Flagg as the headquarters of the Singer Manufacturing Company. The company was founded in 1851 by Isaac Singer, whose wife was the model for the Statue of Liberty. The actual offices were accommodated in the lower block of 12 storeys while the stunning red-brick and bluestone beaux-arts tower, with its distinctive bulbous top, recognisable from miles away, served largely as an enormous advertisement for Singer Sewing Machines. 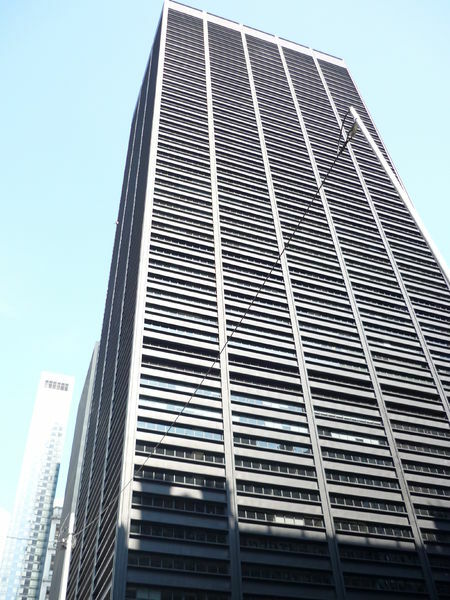 On moving its headquarters to the Rockefeller Center in 1961, Singer sold the tower to a developer who was hoping to tempt the NYSE to relocate there, but due to the shape of the building there was too little office space and so it was sold to U.S. Steel, who dismantled the whole structure and replaced it with the 226m high skyscraper we see there today, One Liberty Plaza. When the Singer Building was taken down in 1967, it became the tallest building ever to be legitimately demolished. Ah, les machines à coudre “Singer” : je crois que mes grands-mères les connaissaient bien ! Thank you for this very interesting note.